Farewell Sean: a sad - and yet 'great' - send off. 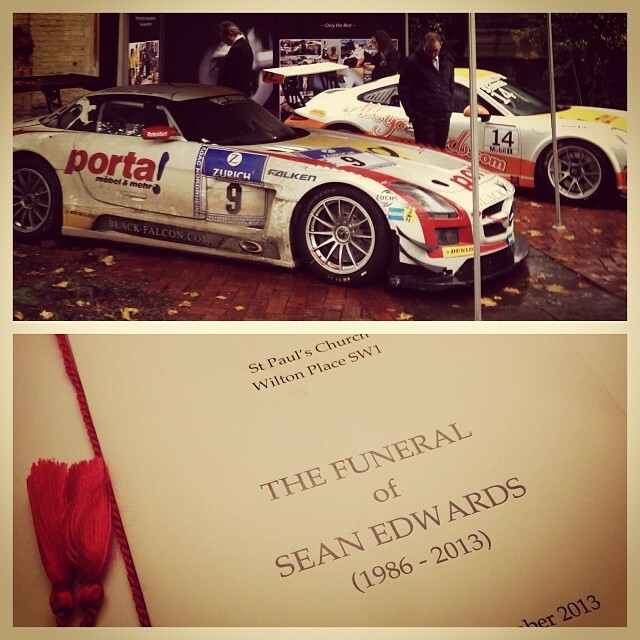 I didn't know Sean Edwards well, yet his funeral yesterday was one of the most moving experiences I can remember. Chris 'Monkey' Harris tweeted after, "I'm not sure if there can be such a thing as a great funeral, but if there could Sean Edwards' would be it." And he's right, it was a thoroughly beautiful service. As heart breaking as much of it was, the out pouring of love, friendship and respect from the sizeable congregation left you in no doubt as to the calibre of man who was being laid to rest. Quite remarkable after just twenty seven years on this mortal coil. Among the many anecdotes traded by motor sport colleagues of Sean's remarkable abilities on track, my favourite was the one where a friend, pleased with himself for driving his best ever race, tumbled back to earth with a thud when Sean innocently enquired of his mate, "Did you have a problem? ", such was the speed differential when Sean came by to lap him. And while friends giggled recalling his less publishable off track escapades, his family and girlfriend showed more courage and bravery than anything I'll ever see on a race circuit with personal addresses during the service that didn't leave a dry eye in the house. A thoroughly proper send off.